I've added a new section to Build-It-Solar that provides some info on solar water heating kits or packages. 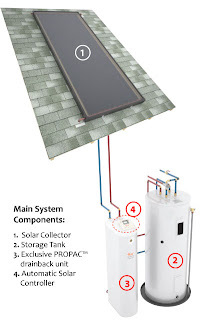 These packages provide a full set of parts (collectors, tanks, pumps, controllers, ...) that allow you to install a solar water heating system yourself. I've tried to aim at kit packages that are high quality, but still save s substantial amount of money over having a system professionally installed. A typical solar water heating system for a family professionally installed runs about $8000. These kits are in the $3000 to $5500 area. You have to add a bit to that for a few things not generally included, but the savings can be of the order of half. By comparison, a system that you build from scratch like our $1K system costs about (surprise) $1000. The kits I've included vary quite a bit in design and come from large and small companies, and address warm and cold climates. There may be something you are looking for. I've also included some alternative approaches that are kind of between the kit and and a full scratch build approaches. The list is just a start -- I'm sure there are other good systems out there that I missed, so let me know if you know of a good one, or if you have installed any of these yourself, and how it went. I like your choice for prefabed parts better then the packaged systems, less expensive. Still I think I'll keep plugging along on my $1000 pex system you came up with. Thanks for all the time and effort you put into your projects and web site.